Cashew nuts are actually seeds in the bottom of the cashew apple, which comes from the cashew tree. This tree is native to northeastern Brazil. The cashew is light-tan in color and shaped like a kidney. Cashews are lower in fat than most other nuts, and the majority of the fat is unsaturated, according to the World's Healthiest Foods website, sponsored by the George Mateljan Foundation. The CalorieKing weight-loss website provides nutritional data on dry roasted cashews without salt added. The values are based on a 1-oz. serving. An ounce of dry roasted cashews contains 163 calories, 13 g of total fat, 4.5 g of sodium, 9 g of total carbohydrates, 1 g of dietary fiber and 4 g of protein. One serving of cashews provides 8 percent of the daily recommended value, based on a 2,000 calorie-a-day diet. The majority of these calories are from fat, at 109 calories per serving. Other calories come from carbohydrates and protein. The total fat content is 13 g, which represents a large 20 percent of the recommended daily value. The bulk of it is healthy unsaturated fat. One serving provides 2.6 g of saturated fat, or 13 percent of the daily value, but also contains 7.6 g of mono unsaturated fats and 2.2 g of polyunsaturated fats. You'll also gain heart-healthy fatty acids: 45 mg of omega-3 and 2,145 mg of omega-6. Cashews are an excellent source of vitamin K, with 9.7 mcg, or 12 percent the daily value. A serving also contains over 3 percent of the daily value of thiamin, riboflavin, vitamin B6 and folate. 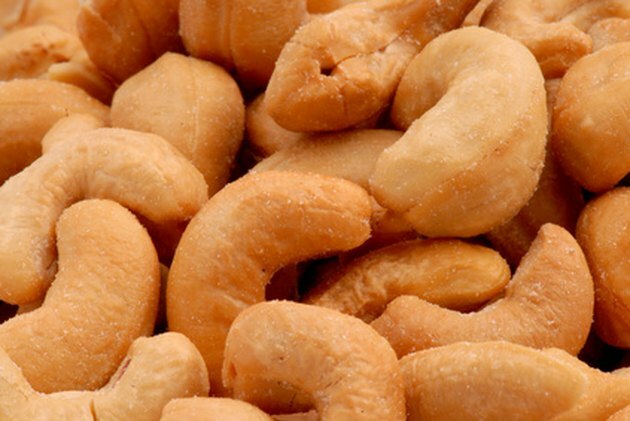 Other nutrients in cashews include vitamin E, niacin and pantothenic acid. Cashews are high in copper, with 0.6 mg, or 31 percent of the daily value; magnesium, with 73 mg, or 18 percent of the daily value; and phosphorus with 137 mg, or 14 percent of the daily value. Other minerals found in cashews include calcium, iron, potassium, zinc, manganese and selenium. Without salt added, cashews have 4.5 mg of sodium, which is barely a trace amount. When salt is added, sodium increases to 179 mg, or 7 percent of the daily value.